Issue 42 of our periodical includes (p. 105) a short contribution by print specialist Ad Stijnman, ‘Terms in print addresses. Abbreviations and phrases on printed images 1500-1900’, referring to a pdf document with an updated version of Appendix 3 in his Ph.D. thesis Engraving and Etching 1400–2000. A History of the Development of Manual Intaglio Printmaking Processes (2002), with a reference to our website. 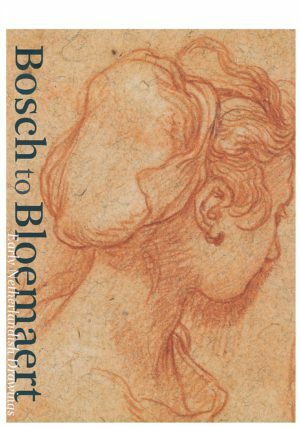 Effective 1 February 2018 Ilona van Tuinen will take up the post of Curator of 16th- and 17th-century Dutch and Flemish Drawings in the Rijksprentenkabinet. She is the successor to Senior Curator of Drawings Marijn Schapelhouman, who retires in August 2017. 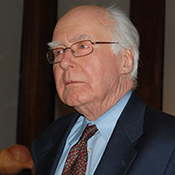 This is the first full curatorship for Ilona after three relatively short assistant curatorships at the Leiden Collection, New York (2011-14), the Fondation Custodia, Paris (2014–15), and the Morgan Library & Museum (2015-). 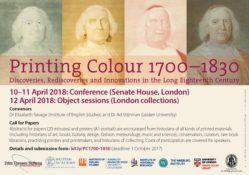 An interdisciplinary conference on the materials, techniques, and uses of colour printing in the West. Following the publication of Printing Colour 1400-1700, the first handbook of early modern colour printmaking before 1700 (by Ad Stijnman and Elizabeth Savage), this conference will be the first interdisciplinary assessment of Western colour printmaking in the ‘long eighteenth century’, 1700–1830. The two-day conference at Senate House (10-11 April 2018) will be followed by object sessions in London institutions including the British Library, British Museum, Senate House Library, V&A and Wellcome Collection (12 April 2018). Abstracts for papers or posters are encouraged from historians of all kinds of printed materials (including historians of art, books, botany, design, fashion, meteorology, music and science), conservators, curators, rare book librarians, practising printers and printmakers, and historians of collecting. Registration fee will be waived for speakers and poster presenters, transport and accommodation also offered to speakers. Please submit abstracts by 1 October 2017, see form.